Astroblast! Takes Off on NBC This April With 26 Exciting Episodes! Astroblast!, the hit CGI-animated series for preschoolers from Scholastic Media and Sprout, is counting down for 26 exciting episodes, set to take off on NBC starting April 4 at 10am. Tune in to catch Astroblast! 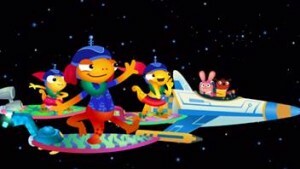 on NBC Kids with their own young astronauts! Two different stories will air every Saturday morning, kicking-off weeks of zany interplanetary adventures for young fans from coast-to-coast. The high-flying hijinks include everything from taking viewers along on a search for a missing giant peach to concocting the galaxy’s largest smoothie, from going on a treasure hunt to surfing in space – the sky’s the limit! Astroblast! follows the escapades of Comet, Halley, Sputnik, Radar and Jet, a crew of animals who run the Astroblast Space Station, the coolest hangout in the galaxy, all under the watchful eye of Sal the Octopus. Along with a constantly changing cast of quirky visitors from other planets, the Astroblast Space Station gang cooks up the perfect recipe for promoting positive relationships, self-esteem, and a healthy lifestyle and physical activity. Self Disclosure: No compensation was received to post. Credit: NBC Kids. The fun begins on April 4 with “A Bird in the Hand.” When Sputnik spots a mysterious bird, she has trouble convincing the rest of the crew that it’s real. But she learns that it’s important to be confident when sharing your ideas – even if others don’t seem to be listening. That story is followed by “Space Safari,” which finds Halley looking everywhere for her favorite surfboard, Neutrino. She assumes her super-cool new surfing friends accidentally took it with them, so she and Comet track them down, only to realize that jumping to conclusions can be a really bad idea. 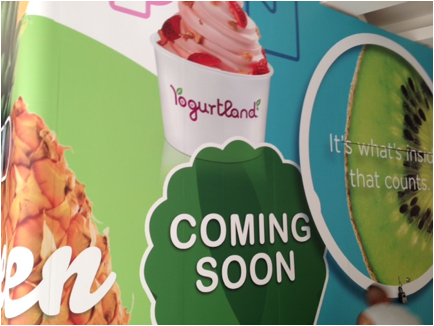 Simon Property Group’s The Shops at Montebello is excited to announce that Yogurtland will open its doors later this spring as the newest addition to the center, just in time for shoppers to cool off with a tasty treat in between shopping. Known for its real flavors, real ingredients, and real relationships with guests, Yogurtland is slated to open an approximately 632 square-foot store located in Center Court, between Forever 21 and Starbucks. Focusing on the highest quality frozen yogurt and toppings, the self-serve retailer will showcase café-style seating, adding a new and exciting element to The Shops at Montebello. Founded in 2006, Yogurtland’s first store opened in Fullerton, Calif. and the chain grew rapidly. In July of 2014, Yogurtland celebrated the opening of its 300th store, and by early 2015, the brand has expanded to over 550 stores internationally. The Shops at Montebello is a modern indoor super regional shopping center featuring four department stores and more than 160 shops, eateries, and restaurants—remaining the leader for shopping in the San Gabriel Valley. The Shops at Montebello is home to Macy’s, jcpenney, Forever 21, Coach, G by Guess and more, with dining options such as BJ’s Restaurant and Brewery, Hikari Sushi, Marie Callender’s and Olive Garden. The Shops at Montebello serves communities in San Gabriel Valley and East Los Angeles including Montebello, Monterey Park, and Rosemead. With its modernized look and feel, The Shops at Montebello strives to provide the best shopping experience with its retailer and dining selections for the entire family. Easter is a time for PEEPS! It’s almost Easter! Time to start thinking about all those Easter goodies and Easter baskets! I can not think of Easter without thinking of PEEPS! 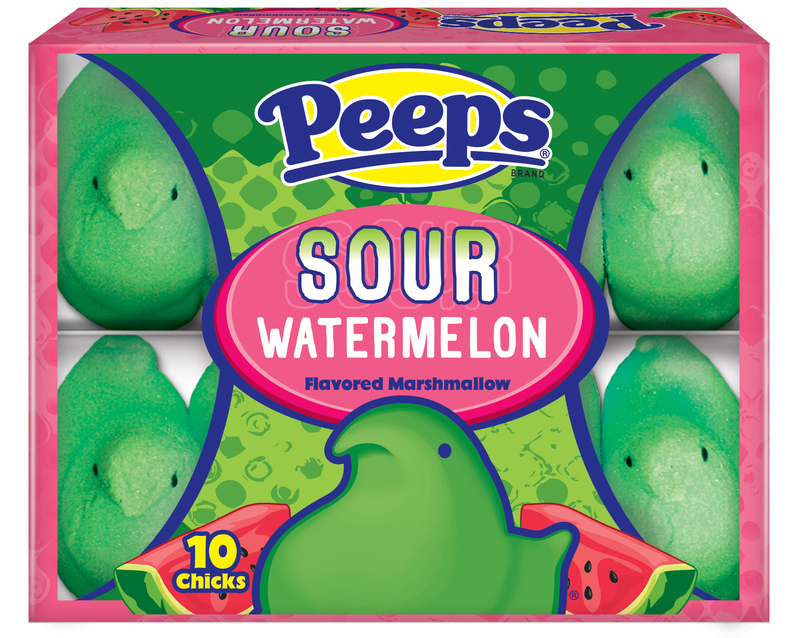 Maybe it is because it was a childhood favorite of mine but I am really quite impressed with how PEEPS continues to come out with more flavors and surprises each year. 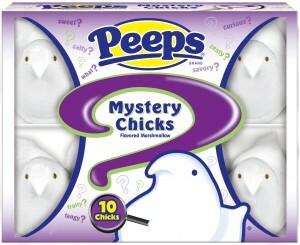 This Easter, there are their typical pink marshmallow bunnies and chicks but there are Mystery Chicks and Mystery Bunnies, Sour Watermelon and my two favorite are the PEEPS Lime Delight and the PEEPS Dark Chocolate Dipped Marshmallow. Yum! 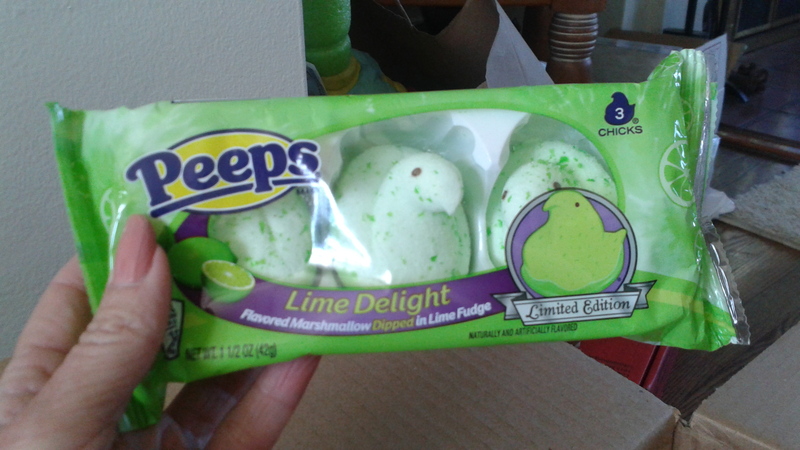 The Lime Delight PEEPS are lime flavored Marshmallow Dipped in Lime Fudge! These really are a Must-Try! I love them! There are actually too many treats to even mention them all! 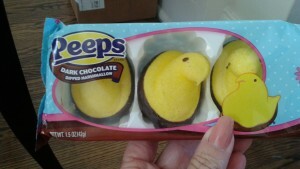 You can find many of these PEEPS goodies at local retailers near you! 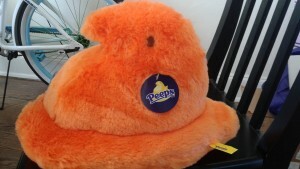 PEEPS also has so many wonderful gift items such as baseball type caps, (I love the purple one I received with a bunny on it!) plush chicks, and even water bottles! 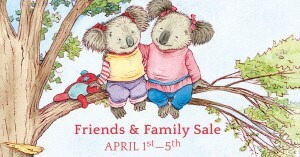 Check out all their items on their website! 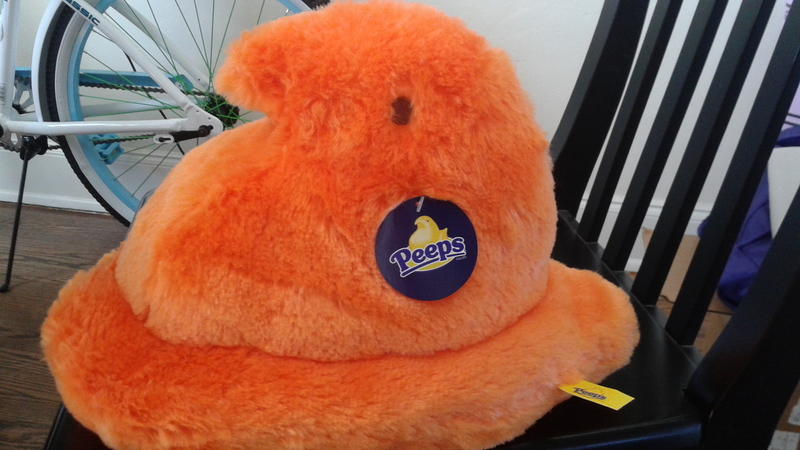 I love Peeps and Company and all their gift ideas. You can find something for everyone! Stay tuned tomorrow! 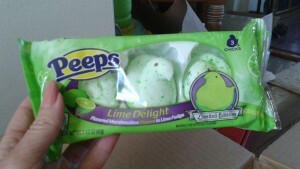 I will be featuring Mike & Ike and Teenee Beanee Brand Jelly Beans, also from our friends at PEEPS & Company. Self Disclosure: I received free samples to facilitate this special holiday post. 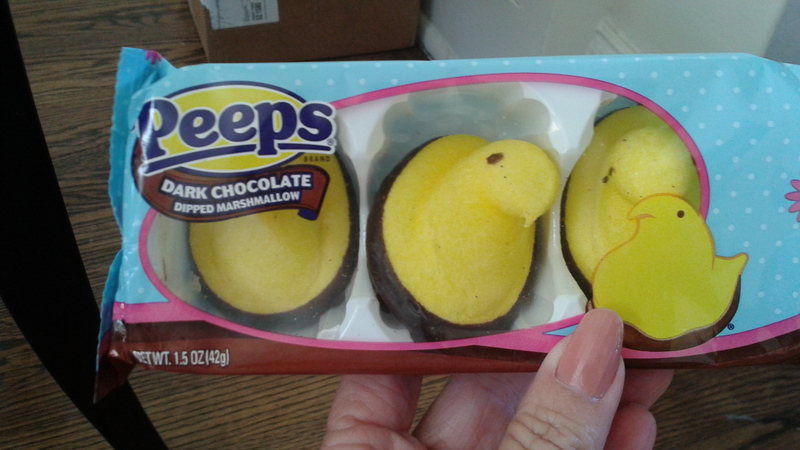 Photos: Top: PEEPS. Other photos: SoCal City Kids. Have a Healthy Spring with CVS/Pharmacy Gummy Vitamins! The verdict is in! CVS Gummy Vitamins are a hit in our house! I don’t know about you but my son is quite picky about the Vitamins he will take without arguing. I am quite picky about what actually is in the Vitamins. My son prefers Gummy Vitamins and can’t say I blame him since I hate swallowing pills. We recently just discovered that CVS makes Gummy Vitamins for kids and there are cool Dino shapes for kids that like dinosaurs and there are ones made with 100% Real Fruit. I am quite happy about the ones made with 100% fruit and was quite relieved that my particular (he hates the word “picky”) son will take them without any type of debate. The 100% Real Fruit Gummy Kids’ Multivitamins also have no added sugar, no high fructose corn syrup and are even Gluten free. CVS also makes a Gummy Kids’ Vitamin C which is actually a Must-Buy this cold and flu season. My son even likes how these ones taste! It doesn’t surprise me that CVS makes these wonderful Vitamins for kids. From allergy remedies to vitamins and cold/flu products, CVS/pharmacy offers a wide selection of products to fit each consumer’s lifestyle and health goals. I’ve been a fan of CVS for years. What I really like about the CVS/pharmacy brand items is that they are affordable but also are high quality. As a Mom, I am always on the look out to save and now I found out where I will be buying my son’s multivitamins! Did you know that all CVS/pharmacy Brand products are 100% satisfaction guaranteed or your money back? Now, that is something really pretty cool, as my son would say! Find a CVS/Pharmacy near you! Self Disclosure: I received free samples to facilitate this feature. Photo Credit: CVS/ Pharmacy. Great Donuts, delicious breakfast sandwiches and the best coffee! Also, the best friendly customer service at Dunkin' Donuts in Long Beach! Where can you go in Long Beach for great Donuts, breakfast sandwiches better than other places I won’t mention and the best iced coffee? My son and I had the opportunity last week to review the Dunkin’ Donuts located in Long Beach and were impressed from the moment we walked into the place. Well, I think my son actually almost ran just to pick out a croissant and donuts. What impressed me at first was the customer service. They were very friendly! I had never tried a breakfast sandwich from Dunkin’ Donuts so I tried the Eggwhite Flatbread and it was delicious! 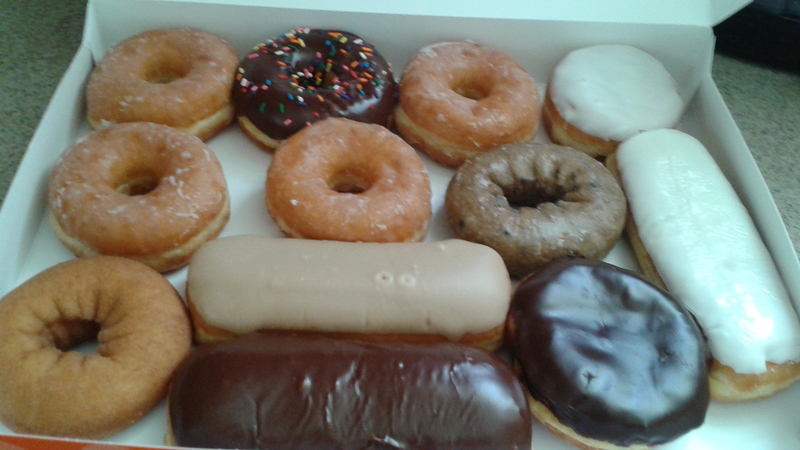 My son loved his warmed up Croissant and we selected a dozen yummy donuts to go home with us. My favorite? 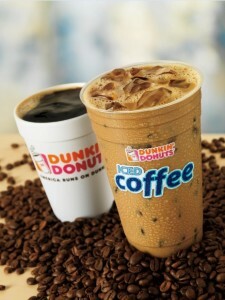 The Iced Latte in Coffee Dough flavor! You must try this one! I just heard that they have New Cheesecake Squares so looks like I will be visiting Dunkin’ Donuts again over Spring break! What I like about this place is that they have so much more than just donuts and is great for everyone in the family. I have to be honest..my son is quite particular about his donuts and he gives Dunkin’ Donuts a thumbs up! Self Disclosure: I received a free gift card for review purposes. Photo Credit (except top photo of our donuts): Dunkin’Donuts. Chuggington Fire Patrol Rescue Day is March 31! Today! 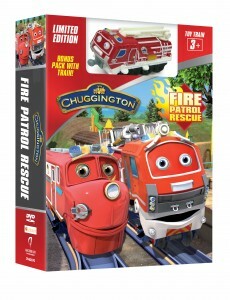 Get Ready for Chuggington Fire Patrol Rescue Day with New Chuggington DVD from Anchor Bay Entertainment! Sound the alarm! The newest action-packed Chuggington DVD, “Fire Patrol Rescue,” is coming down the tracks on Tuesday, March 31, from Anchor Bay Entertainment – and to celebrate the new release, we invite you to participate in “Chuggington Fire Patrol Rescue Day,” taking place across the blogosphere the same day! We received a DVD and a fun kit to review in honor of this day! I was hoping to watch with my younger nephew and celebrate but due to illness, this couldn’t be done! 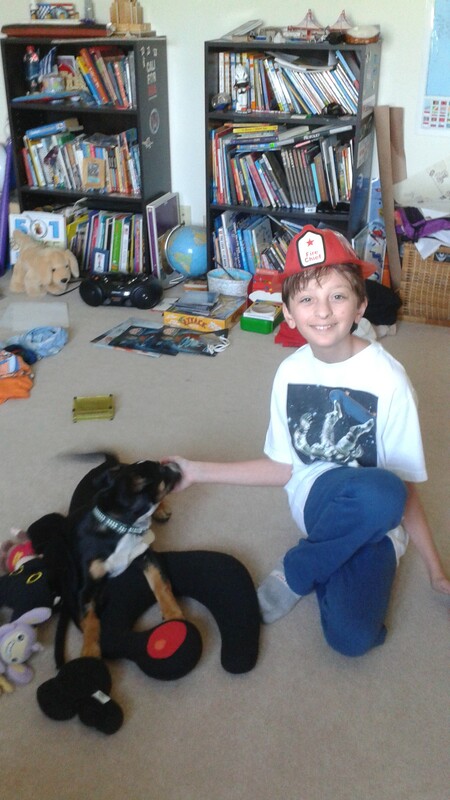 But, my 11-year old son and I watched the Fire Patrol Rescue DVD and we both give it a thumbs up! I know this would be great for younger children ages 3-6. It’s fun and what young child doesn’t want to be a firefighter? Joshua with his Fire Dog, Bink! Create a home escape plan so every member of your family knows what to do and where to go if there’s a fire. Designate a meeting spot, such as a tree or mailbox, that’s a safe distance from the home. And practice your home fire drill both at night and during the day. Keep matches and lighters out of sight and out of reach from children. Store them up high, preferably in a locked cabinet or drawer. It’s also important to teach kids that lighters and matches are tools for adults only and that they should tell a grown-up if they see these items lying around. Always keep an eye on the stove while you’re cooking, and use a timer as a reminder that the stove or oven is on. Create a “kid-free zone” around the stove as well as areas where hot food and drinks are prepared. And make sure to keep anything that can catch fire, including oven mitts and towels, away from hot appliances! Smoke detectors are a key part of a home fire escape plan. Make sure to install smoke detectors on every floor of the home, especially inside and outside bedrooms. Don’t forget to test all smoke alarms at least once a month! If, during a fire, you have to escape through smoke, get low, go under the smoke and close the doors behind you as you leave each room. It’s crucial to remind children that, once outside, they should never go back inside for anything, including pets or toys. It’s best to wait to call the fire department until you get outside and are a safe distance away from the fire. Self Disclosure: DVD and Fire hat were received to facilitate this feature. Top Photo Credit/Safety Tips/Coloring Sheet: Anchor Bay Entertainment. 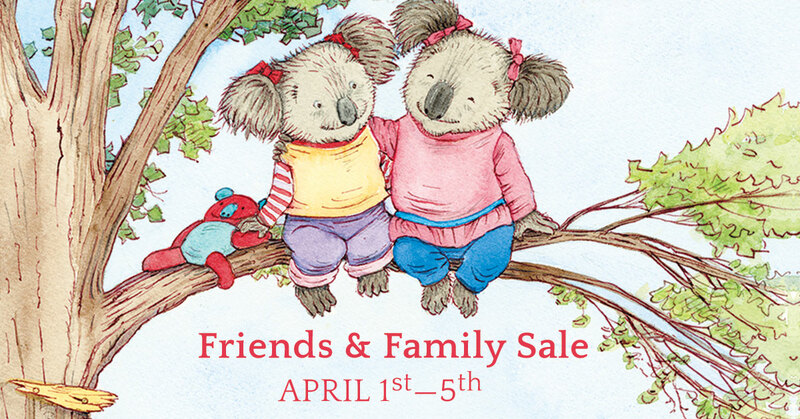 “Friends and Family” starts 4/1 ! Spring is a season of newness; new warmth, new growth, and new additions to families! We are excited to partner with Mommy Scene’s Spring #BabyShowerFaves to bring you a fabulous giveaway, featuring everything from A to Z for a mom & new baby! 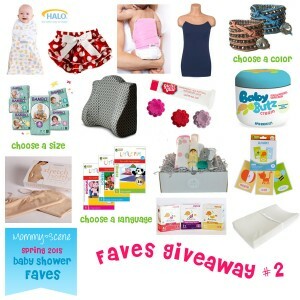 Don’t forget to check out the Baby Shower Faves Gallery over at Mommy Scene! We are also excited to announce the launch of Sudsy Dough Moldable Bath Soap on Kickstarter! Squeeze and squish Sudsy Dough in the bath, rub it on as a cleansing body wash, or take it outside the tub and make custom-shaped soaps. Created by the editor of Mommy Scene, Sudsy Dough helps make bath time fun! To find out more about Sudsy Dough, click here! Don’t forget to read my review! 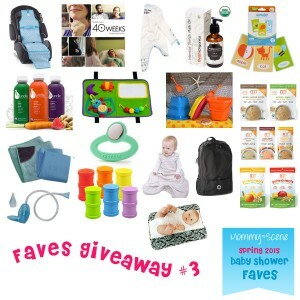 Mommy Scene, Green Scene Mom, and the affiliated blogs including SoCal City Kids are not responsible for sponsors who do not fulfill prize obligations. Prizes will be sent to the winners directly from each participating brand. 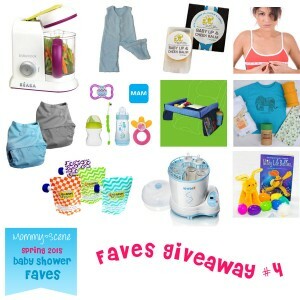 5 winners’ names will be posted on the Spring Baby Shower Faves page once the giveaway ends and each winner will be notified via email after April 15th, 2015. Winners will be chosen randomly in sequence for each of the five prize sets. 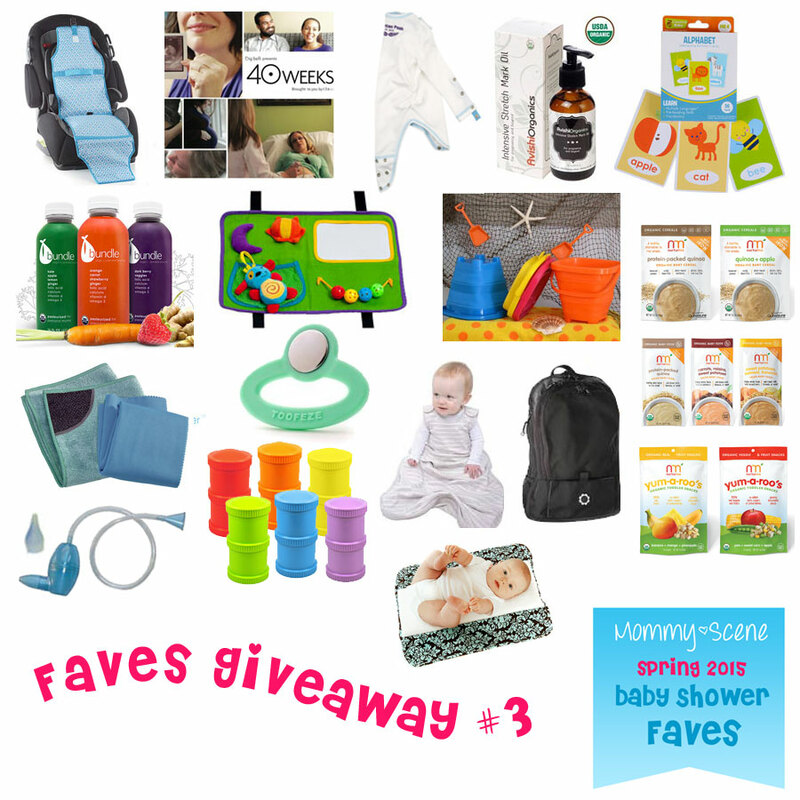 The Spring Baby Shower Faves giveaway is open to the US and Canada. A shipping charge to Canada may apply on some of the prizes, depending on each brand. Entrants may receive a followup email from some of the participating brands. Self Disclosure: No compensation was received.